KNOXVILLE, Tenn. — You just don't show up to run a 5k or half marathon or full marathon. You need to train. 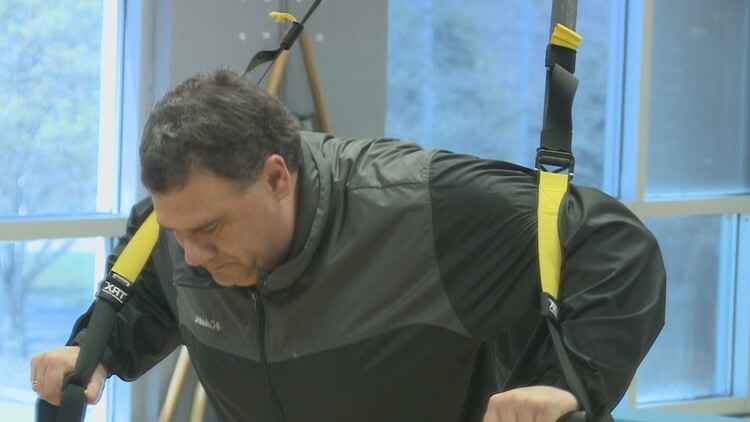 At lunchtime two or three times a week WBIR Meteorologist Todd Howell and WBIR Anchor Russell Biven work out with Fort Sanders Health and Fitness Center Personal Trainer Chris O'Hearn. "I think the first two or three workouts I was just physically sick after but you start to get stronger and that gets a lot easier," Biven said. Todd said, "It's just like what Russell brings to Channel 10 straight from the heart every day. I absolutely love, it's a difference maker, doing it with Russell and Tom." Tom is Tom Barclay, one of the digital gurus behind the scenes at Channel 10 who is also training for the half marathon with the all-veteran Covenant Health Knoxville Marathon Team. "The best part of it is doing it with these guys. No doubt about it. I mean I would not be up here doing it alone I need the accountability," Biven said. "When I'm ready to be done (Todd) says let's do one more and how do you tell Todd no?" Todd's knows what to expect. Last year, he trained for and finished the half marathon. "Last year I did not really have a goal except my son Davis had run a half marathon and he finished in just over two hours and so I said OK I'll have a goal of two hours. Missed it by that much. Seventy-one seconds over. So the carrot dangling this year is to try to do it in under two. I hope I see a one 59 something as I'm getting close to the finish line. That's the goal," he said. It's a race. It's running. So what's the point of strength training? "If you have a strong core, if you have a strong resistance muscle training, then you are going to be able to run better, you're going to have better posture, you're going to function better in your life and it's not just about running it's about how do we function better in every aspect of our life," Personal Trainer Chris O'Hearn explained. "We're talking about how do we not only just reach this goal but then how do we bring this into the goals in the rest of our life whether it be weight loss, whether it be feeling better, whether it be stress reduction and all those things that can help us out through working out." Todd said, "I think the goal is to try to be able to keep doing that long after the race ends." Russell said only half joking, "April 1st Todd and Tom will be back in this room working out and I will probably be down at Chick-fil-A. No, I'm going to keep doing it, I mean, you know." The Covenant Health Knoxville Marathon is March 31. WBIR will provide complete live coverage that morning.